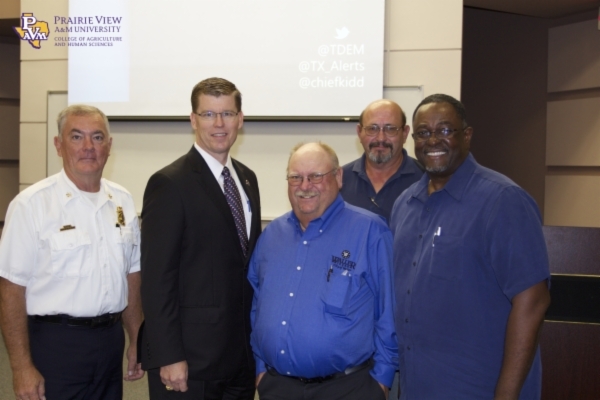 Waller County Fire Chiefs with The State Director for Emergency Management, Nim Kidd, at the PVAMU-Emergency Management Summit. Chief Freddy Williams – Tri-County Vol. Fire Dept., Director Nim Kidd, Chief Gene Schmidt-Waller Vol. Fire Dept., Chief Jimmy Orzak – Rolling Hills Vol. Fire Dept. and Chief Frank D. Jackson – Prairie View Vol. Fire Fighting Association, Inc.